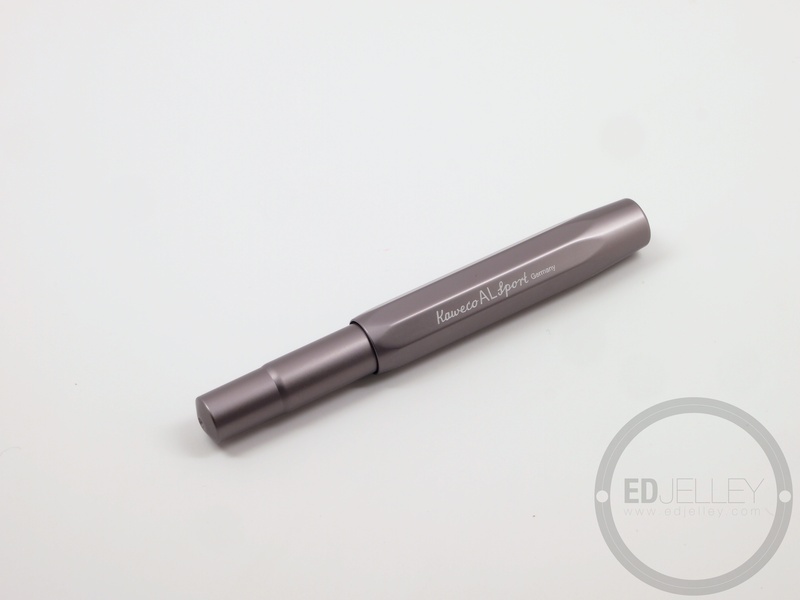 Description: The all-aluminum version of everyone’s favorite pocket pen.  If you would like to support edjelley.com, you can do so by purchasing the Kaweco Al-Sport through this Amazon Affiliate link! I’ve had this pen on my wishlist for what seems like forever…no really, I checked my wishlist on JetPens – it’s been there since October of 2011. Essentially, the AL-Sport is the same as the Classic Sport, except with an all-aluminum construction that oozes quality. The added weight and balance to the pen, along with a newly designed interchangeable nib/feed system makes this pen an absolute pleasure to write with and carry. Thanks for reading and enjoy the review! I would just like to thank Sebastian at Kaweco for sending over a huge box of goodies, this pen included. I’m really enjoying the AL-Sport and I’m happy to finally have it in my collection. Like my review of the Classic Sport, I was shocked by how small the pen is once you take it out of the box. 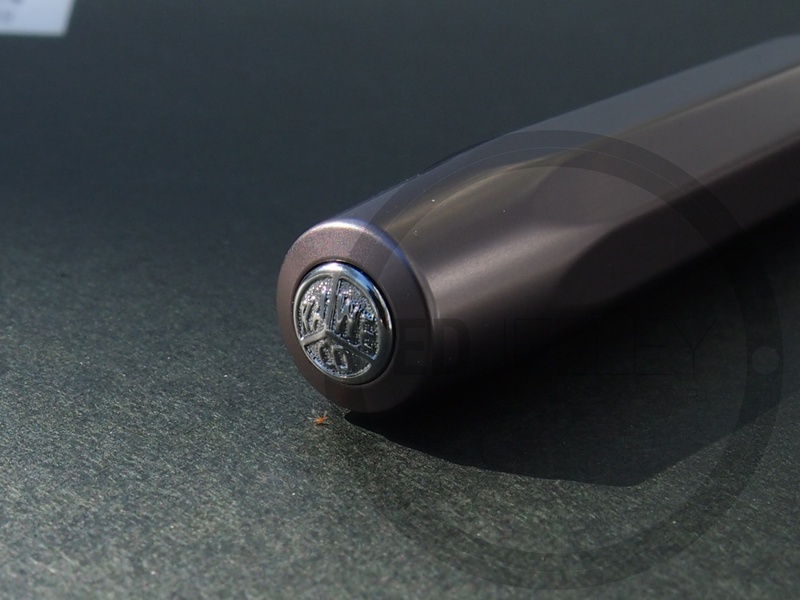 It’s nearly identical to the Sport, except the threads are slightly different and the pen body is made entirely out of aluminum. The grey finish both looks and feels great. 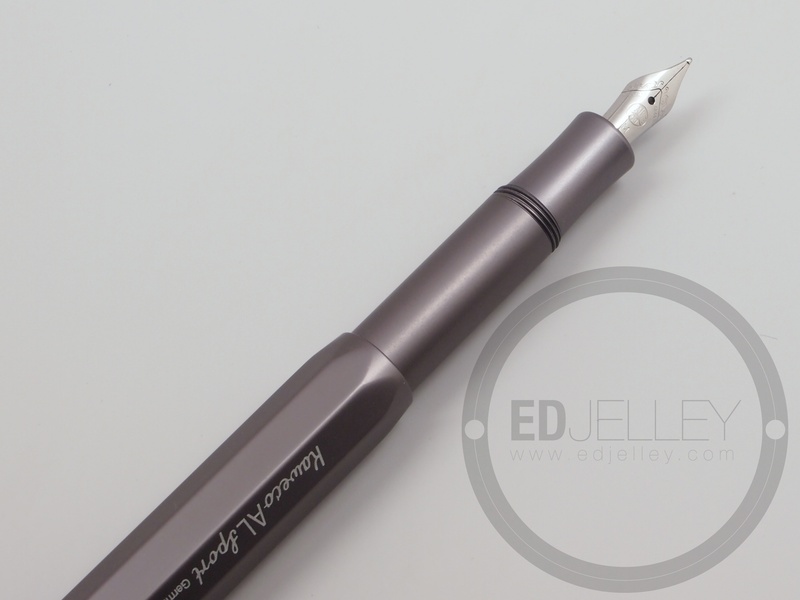 When capped, the pen is small, but when posted, it is very comfortable to write with. The pen comes in a nice gift tin, which is always welcomed over a cardboard box. The tin is small and compact like the pen, so it won’t take up much room in storage. The medium nib on the AL-Sport was smooth and wet out of the box. It was a much better writer than the fine nib on my older Kaweco Sport. 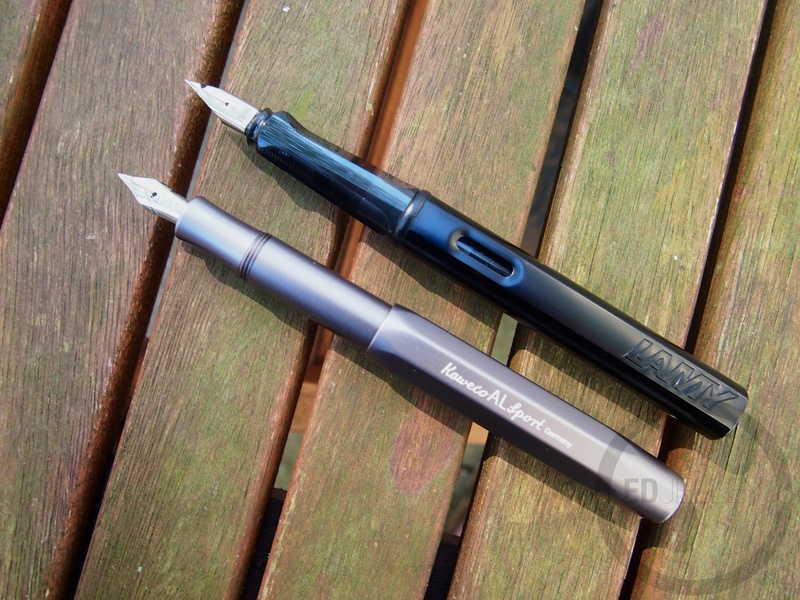 There’s a new feed design on all of the newer Kaweco models, allowing for quick and easy nib changes. Simply grasp the nib, unscrew it, and screw the new feed in. It’s very easy to do, and once you know how the system works, it won’t give you any trouble. Just make sure the nib is properly seated in the groove on the feed before screwing it back in. The removable feed also makes for easy cleaning. Simply take it out, and rinse it off. It’s especially easy when using disposable cartridges. I’m love the smoothness and reliability of the medium nib that came on the AL-Sport. It’s definitely up there in smoothness, and I believe it’s as good as it gets when it comes to smoothness of less-expensive steel nibs. The filling system. 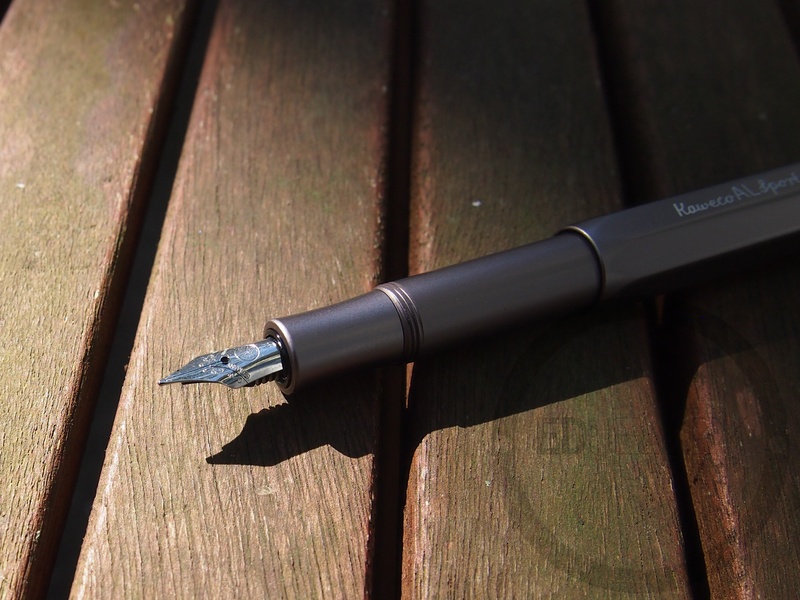 There’s some good news…Kaweco now offers their own converters! No more guess work, and “will it fit” with other converters. This is a huge deal, because they were never offered in the past. I’m currently using a cartridge of Kaweco Pearl Black, which I am very happy with. No more refilling old cartridges with a syringe either. The addition of a converter to the line makes using bottled ink much easier. 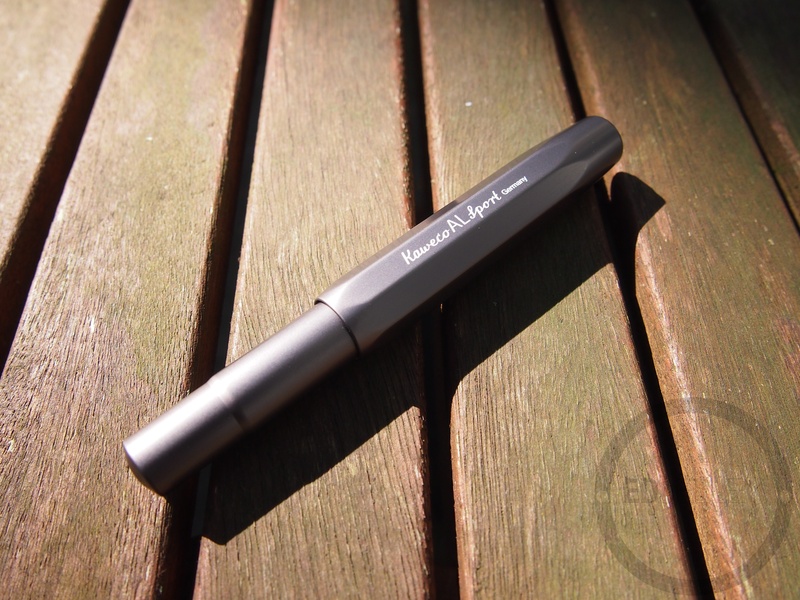 I have the converter in another pen right now, and it’s performance will be tied in with an upcoming review. I much prefer the weightier body of the AL-Sport to the plastic Sport. The build quality of the pen is impeccable and I have no concerns over it’s durability and construction. It’s great to have a pen I can throw in a pocket or bag and not worry about. 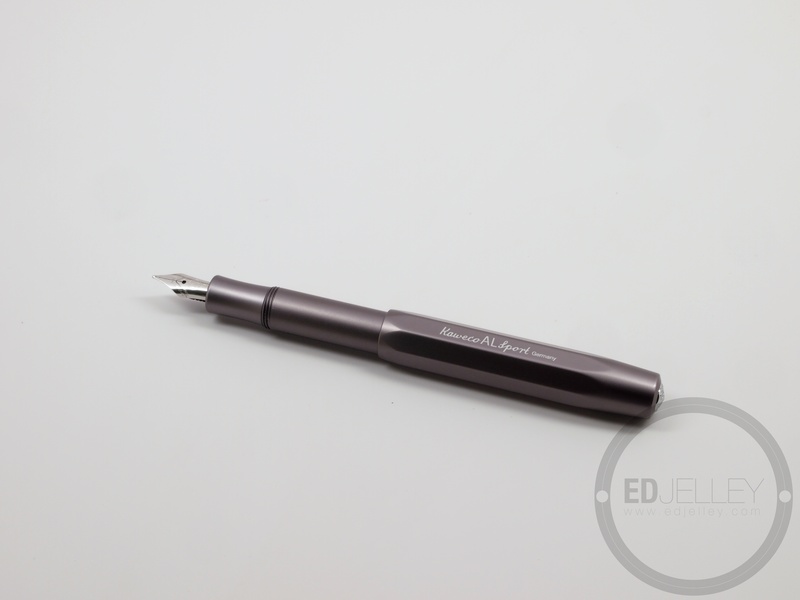 It’s compact size when capped allows for the pen to disappear until you need it. The threads for the cap are not sharp, but the shorter grip section of the pen may result in more finger-to-thread contact than one is accustomed to with a full sized pen. The grey anodized aluminum body is smooth and comfortable in the hand, but the finish may get slippery should you have sweaty hands (I do, it’s nothing to be embarrassed about). The weight, finish and build quality are all great, and it is a welcomed premium feel over the Classic Sport’s plastic construction. It’s definitely worth the extra money for the aluminum version. Another detail I found interesting about the pen was the small rubber ring inside the cap. This is so that the cap may post on the body without scratching the surface or slipping off. It’s nice to see that this pen was thoroughly thought over, down to the smallest detail. The AL-Sport is a great pen. The new nib, feed, and swap-ability makes up for the shortcomings of the plastic version of the pen. The availability of converters straight from the manufacturer makes use with bottled ink much easier. It’s really hard to come up with anything negative to say about the pen, I’m really enjoying it. I was going to say I wish I had picked one up sooner, but the new nibs, feed, and converter are all welcomed updates that make this pen that much better. 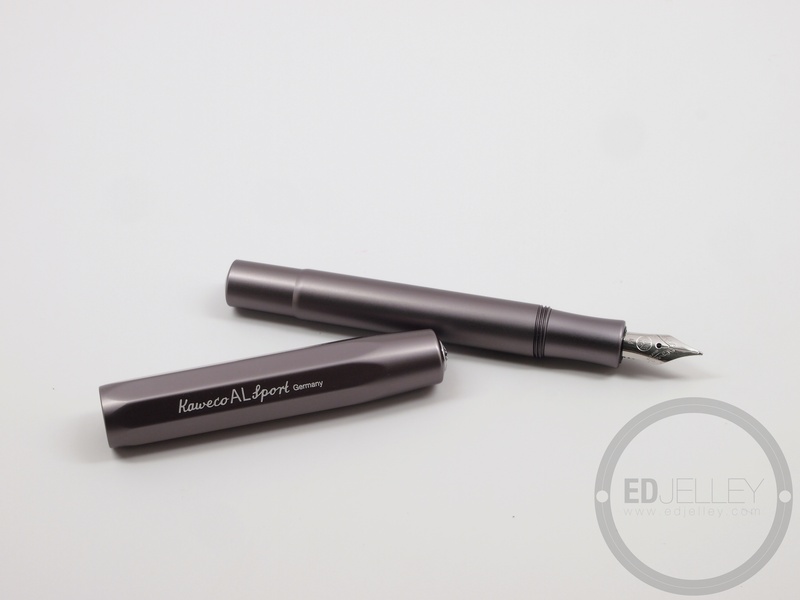 Thanks again to Kaweco for sending me this pen, make sure to check out the rest of the Kaweco line, my review of the Kaweco Sport, and a list of online retailers where you can pick up this pen. 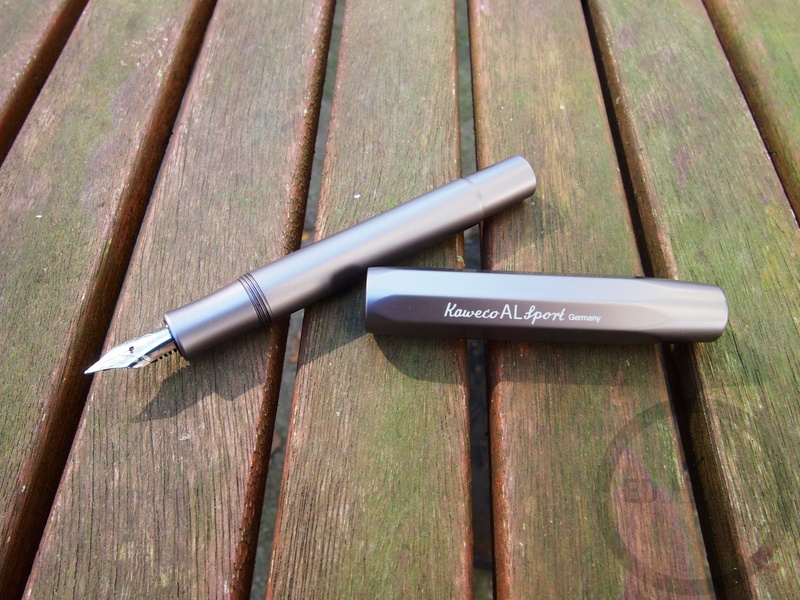 Disclaimer: This pen was provided to me as a review unit, free of charge, by Kaweco, Germany. I was not compensated for this review, and this did not have any effect on my thoughts and opinions about the pen. Thank you for reading! Nice review! I’ve always wanted to get one of these, since I love my Sport so much. The new converter and feed sounds like a good upgrade to the line. I’ve had a sport for a while now, the aluminum feels so much nicer. Unfortunately the converter leaves much to be desired. The new nib system is very nice though. Oh, I like this color. Your picture even made it look a little opalescent (and I am all crazy about purple-silver-gray). 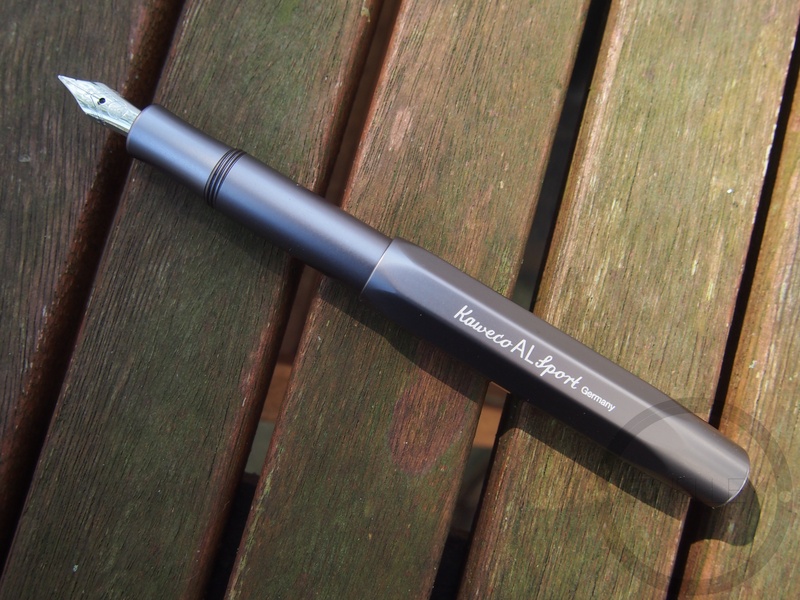 It’s definitely got a brownish-purple tint to it when compared to my graphite Lamy AL Star. It’s an interesting color!